Today something truly disturbing happened with my Apple ID. It all started last night when I used my iPad Pro to buy a Hue Hub from the Apple Store using Apple Pay. When prompted I happily put my finger on TouchID and the website confirmed that my payment had been accepted. A few minutes later I got a confirmation that my order was being prepared. It included an order number ending in 9168. In the morning when I got up, I had an email from Apple entitled “Action Required” and referenced the same order number 9168. In the email they politely explained that my credit card provider had declined payment. In the email was a link to Order Status that I was encouraged to click to verify my payment. Now I’m not one to click links in emails but clearly this was my order so I clicked away. When I got to Order Status, the Hue Hub was not in the list of orders. I could see the watchband I bought last week, but not the most recent order. That was weird. I went back to the original happy confirmation order and clicked on the order number from there. 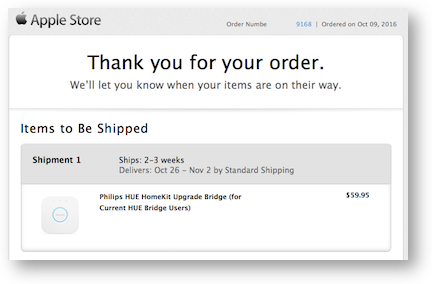 It directed me into the Apple website showing me the Hue Hub order 9168. Above the order though, it had a bright colored banner with words explaining that my order was not complete because of a problem with billing. It suggested I click a button to fix it. When I clicked the button, that’s when I knew something very odd was going on. The next page told me that my Apple ID was not associated with that order. And then it told me to log in again. I repeated these steps three times thinking I must just be missing something but I couldn’t get out of this loop. I called AppleCare (told you it was my new hobby) and got through to technical specialists Christopher and later Keith, who talked to the sales side. I told them I didn’t want to talk to sales directly unless they were on the phone because this sure smelled like a technical problem to me. Keith talked to sales, and sales told him that my card was being rejected. Keith suggested that I go into appleid.apple.com and check my card. He did screensharing with me to watch (and showed me how to pause screensharing when sensitive bits came up on screen). We saw the last four digits of my correct credit card in there, but no expiration date and CVV code was showing so I entered them. While he watched, I tried to order the Hue Hub. When I tapped on Pay with Apple Pay, I was immediately rejected and asked if I wanted to pay another way. Keith got back with sales and they thought maybe I should just try another card. No thanks, I don’t want to use another card. They asked if I’d mind just using the card instead of Apple Pay. No, I want Apple Pay to work! Finally Keith said that he really needed to hand me off to Doc in Sales because he was sure we could figure it out. Doc and I chatted for a bit about the problem and I explained that we had confirmed the right card information. At some point, Doc just happened to drop in conversation the last four digits of my credit card. Except it wasn’t my credit card number. It wasn’t a number I’d ever had. I keep records in 1Password of all my cards and even expired ones so I was sure about that. I checked with my kids in case their cards got tangled in there when they bought their iPhones. We have a family plan with Apple and with AT&T so I thought maybe that was it, but it wasn’t either of their cards. I asked Doc how they could have a different numbered typed into his system than I was seeing in appleid.apple.com. He said he had no idea, but offered to type in my real number. As soon as he did, emails started flying into my account completing order 9168 for my Hue Hub. Doc did suggest that I drop Apple a note over at feedback.apple.com and you know I gave them the full rundown. 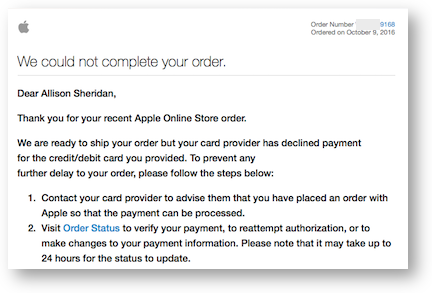 I guess the good news in this story is that Apple’s systems didn’t let me buy on the other person’s credit card number. The bad news is that the database got mixed up in the first place. I would have put this entire experience off to just one of those things, except I remembered a story Tom Merritt talked about on the Daily Tech News Show recently from macrumors.com/…. In that article they said that users were reporting iPhones which became activation locked with Apple ID addresses that did not belong to them. Activation Lock is the feature that ensures that people can’t steal phones and then get Apple to unlock them, so the only way you can get this fixed is to prove you really bought the phone. According to the article this happened when people had either just bought the phones or when they’d done a factory reset. This could be entirely unrelated to what happened to me, but it sure smells like the Apple ID database might have some problems over at Apple. Oh wow! This is definitely not good news. Hope they get this straightened out quickly! Allison, remember when Apple thought my new iPhone was in Florida? I think it is a closely related issue. Turns out I was not the only one with an email attached to a brand new phone that was not theirs. Rene Ritchie was talking about the problem on the iMore Show today. I may have been patient zero! Hi! I learned that when you pay with Apple Pay, with your watch, iPhone or on internet sites, the last four digits of your credit card associated with your Apple Pay are never the same on your bill as what you see on your credit card. It’s a security measure used by Apple to make transactions more secure. When I first started to use my watch to pay with Apple Pay and I had to return an article, at the store they told me I could not get my refund because the four digits number appearing on my bill did not correspond to my last four digits number on my credit card. I finally got a refund after I explained to the manager that I paid with my Apple Watch. It’ s the same on the Internet. The other day, I bought something in the Apple Store and paid with Apple Pay. The same thing that you mentioned happened to me. I called my bank because Apple refused my payment. I learned that problem is occurring with all the banks because Apple Pay on internet sites is fairly new, so banks are not ready for that, yet ( I live in Canada and paying with your Apple Watch or iPhone using Apple Pay is new for us). Great insight, Francine and something everyone needs to be aware of if they run into trouble. In this case though, the Apple person was looking at my “real” credit card number in their system that Apple Pay attaches to. As soon as he changed it to the correct (real) credit card number, my Apple Pay transaction went through. The erroneous activation lock problem might be explained IF stolen activation locked iPhones are being activated by spoofing other people’s iPhones IMEI numbers. If above is possible could a stolen iPhone using your IMEI using Apple Pay cause your problem? Or maybe Apples database management is really buggy. Who knows.